Latham maintains that his group's idea is not pie in the sky and that its feasibility is supported by two of the world's leading computer climate models, as well as recently obtained experimental cloud data. He points out that, unlike rival techniques, the system could be used to vary the degree of cooling as required and could be switched off instantaneously if needed. However, he adds more research must be done to find out a number of unknowns - such as exactly what fraction of spray droplets will reach the clouds - and to establish that the technique would not create any harmful climatic side effects. More work must also be done on the spray technology, he says. A couple of really important factors, worth keeping in mind when evaluating these kinds of proposals: 1) Albedo-changing geoengineering (like the water spray, or stratospheric sulphate particles) is a symptom-reduction treatment, not a cause-reduction treatment. This means that if you stop the geoengineering — and you haven't been reducing carbon outputs — all of the heat comes back, and there's even a "bounce" effect where it can get warmer faster than it would have otherwise. 2) Geoengineering of this sort does nothing about carbon, but excess carbon does more than just warm the air. Ocean acidification is probably the biggest problem, causing coral extinctions, diatom extinctions (HUGE foodchain implications), and similar nastiness. Geoengineering is useful if it's coupled with carbon-reduction, since it can slow the onset of some of the warming-related catastrophes. It's not a cure or a solution for global warming, though. It's a cough-suppressant — can be ideal for letting you sleep and get rid of your flu, but can make the flu stick around longer if all you do is use it to get through a work day. 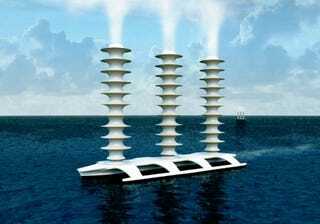 Cloud-Seeding Ships Could Combat Climate Change [via Physics World] Thanks, Ethan!